The IEC Standards for thermoset composites are developed by a team of experts (currently six) from the UK, Austria, Germany, France, the Netherlands, and the United States. They are the most current and up to date standards for industrial laminates in the world. A Norplex-Micarta employee is the current U.S. delegate and Convenor (chairman) of the Working Group (IEC TC15 WG-6). 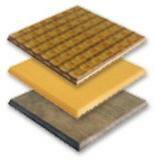 It is the job of the Working Group to write standards for the thermoset composites listed below.